TORONTO - Team rosters for the 2019 edition of the Super Cup tournament have been announced! And with six squads going at it this year it's expected to be a full house at McCormick Arena this coming Friday, April 19. The BIG STARS will once again be helmed by Humiliation captain Mike Thompson, whose charges this year include Wheatfield Souldiers Jimmy Murphy, Brad Sveistrup and goaltender Sheldon Shurland, Parkdale Hockey Lads Fabian Ruzic, Fil Freitas and Simon Evers, and Humiliation blue-liner Rob Thompson along with Cam Pyper, Ian and Rich Thompson, Trevor Smith and Colin Blayney. The SCREAMIN' JAYS will be backstopped by Lads goaltender Luis Freitas and GM'ed by Humiliation sniper Jimmy Sioukas. Brockton Rockets speedster Bryan Eelhart, Jason Pilling, Mike Daniels and Scott Prudham will impart some 2019 UUHA Championship swagger to the squad, while GSI's Seth Singer, Lads veteran Roger Santos, Humiliation rookie phenom Sean Morrison and Wheatfield Souldiers forward Bob Lavery will compliment the diverse lineup. Dan Schwartz, Luke Connors and Vlad Intelegator round out the bench. TEAM IMPULSE! will see Lads veteran Mike Frolick jazz things up with friends and family members Jim and Nic Frolick, Joe Bourrie, Mike Cerny, Bob Gorman and Adam Fell, along with Thomas Heap and Brockton Rockets Blaine Tynes, Joseph Desjardins, Richard Clarkin and goaltender Jonathan Dickson. Wheatfield Souldiers forward Mike Harkness rounds out the line up. TEAM CANADA GM Jay Ward will attempt to get his side back in the Super Cup Final, this time along with Tony and Max Debogorski, Steve Hooey and Jokers veterans Sean Cullen, Duncan Fremlin and Derek Scott. Brockton Rockets James Nielson and Mario Vella will provide some recent clutch-play experience, while GSI regular Nick Purdon will reunite with Isles alumni Andrew Scott for the occasion. Wheatfield Souldiers veteran John Sutton will represent Team Canada between the pipes. TOROS GM (and recent first-time UUHA Championship winner) John Marshall will call on the likes of Nick and Ben Wilcox, Dave Bennett and Ian Mosby to advance the Toros' cause. Wheatfield Souldiers regular Jonathan Weier and GSI goaltender Joseph Steinman will combine with Tim and Oliver Vesely, along with scoring threats Cam Moorehouse, Blair Copeland and Jon Clegg for the occasion. Finally, this year's edition of the REBELLION will see GM Rodney Merchant call on the enduring spirit of Louis David Riel to motivate his squad toward another (consecutive) Super Cup title. Brockton Rockets stalwart Oliver Sutherns will attempt to keep pace with talented teenagers Jacob and Nathan Sutherns, while Jokers sniper Steve Levine, teammate Craig Hughson and Greg Spanovik focus on filling their opponents' nets. Humiliation veteran Clint Whitworth and Souldiers alumni Wes Gerbrandt will fight for what's right alongside Ariel Cabalin, John Minnery and goaltender Daniel Hammerle, who recently put up some impressive numbers backstopping the Humiliation on a deep UUHA Playoffs run. Here below is the game schedule and team pool designation for Super Cup 2019, taking place this Friday, April 19 at McCormick Arena from 10:00 am until 6:00 pm. 1:45 pm - SCREAMIN' JAYS vs. IMPULSE! 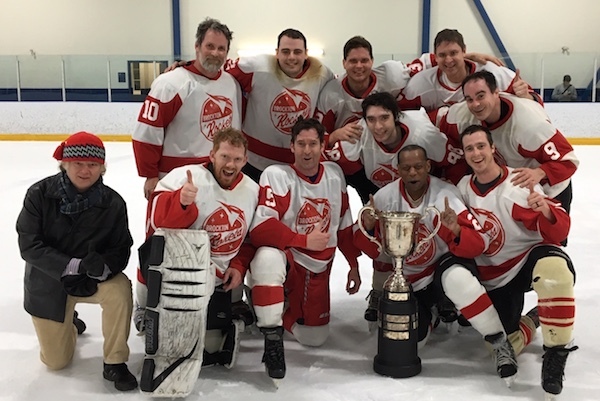 TORONTO - The Brockton Rockets defeated the Beau's Beer Hack 3-1 this past Saturday night at Upper Canada College to claim their first UUHA Championship title. Rockets forward Oliver Sutherns scored just a minute-and-a-half into the 1st period, converting a passing play with Dustin Harris and Blaine Tynes to get the Brockton Boys on the board early. The same combo would strike seven minutes later, making it 2-0 in the Rockets favour. After a scoreless 2nd period that saw both teams trade five shots each, the President's Cup-winning Hack halved their opponents lead as Aaron Foster found Louis Durand streaking toward the net where he solved goaltender Jonathan Dickson with a twine-bulging wrister. But as the clock ticked down, and with Hack goalie Aaron Brophy on the bench for the extra attacker, Mike Wilcox would seal the deal with an unassisted empty-netter. The Beau's Beer Hack (who have two UUHA Championships to their credit) would not leave the ice empty-handed, though, as team captain Joe McGinty was officially presented with the Presidents Cup, and veteran Hack forward Aaron Foster was awarded the UUHA MVP Belt as league MVP for the 2018/19 season. Earlier in the evening, the Humiliation claimed the Bronze Medal Gnome by defeating the Wheatfield Souldiers 5-2. Luke Moretti potted two goals and was credited with two assist in that one, while linemate Paul Morris scored two goals as well. Mike Thompson had the other goal for the Humiliation, while Wheatfield Souldiers Scott Pettus and Mike Harkness tallied for the losing side. Souldiers goaltender John Sutton faced 20 shots, while Humiliation back-up tender Dan Hammerle was tested with 16 attempts. In the 7:00 pm Consolation Final, the Parkdale Hockey Lads saw their losing streak extended to a remarkable 14 games as they were blanked 5-0 by the Gas Station Islanders. Dom Chartier, Steve Boyd and Richard Switzer were among GSI goal scorers and Joseph Steinman earned the shutout. Live rink rock was provided by the Black Aces (Jokers regulars Marc Hickox and Tyler Stewart) along with a slate of guest players including the Sadies' Sean Dean, various UUHA players including Luke Moretti, Wes Gerbrandt, Simon Evers and Brian Bentley, along with percussionist Aspen Shurland.